Joachim Antonisz. Wtewael is considered to be one of the last Dutch Mannerist painters. While living and working in Utrecht, his paintings reveal the influence of his trips to France and Italy as well as that of earlier painters. Wtewael frequently executed several versions of the same subject with only slight modifications to some elements in the composition. He also experimented with different supports and formats and achieved a brilliant level of technical mastery. Following the example of the Haarlem painters, his paintings became less ornate although they always retained a certain artificiality. 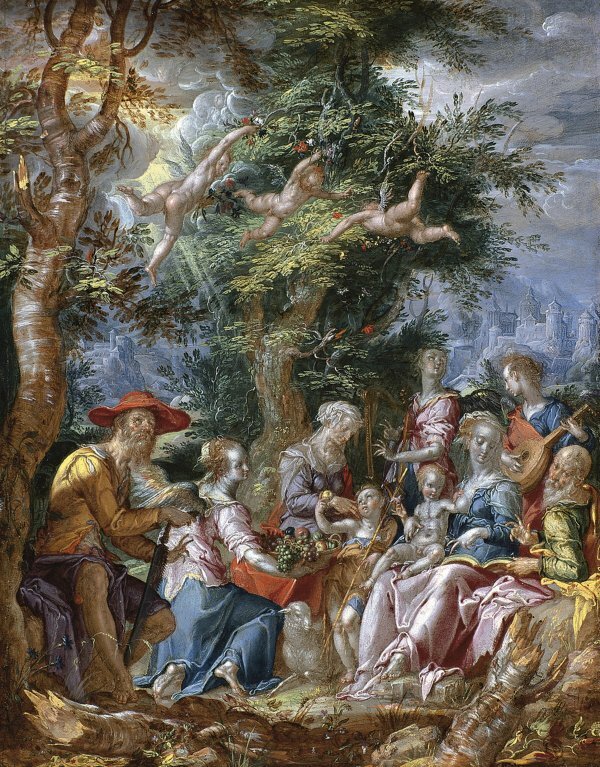 In this work on copper Wtewael depicts the Holy Family in a natural setting, accompanied by saints and angels. On the right is the Virgin with the Infant Christ on her lap. To one side is the Infant Saint John the Baptist with the Lamb and Saint Elizabeth, and on the other, Saint Joseph who looks out at the viewer. Behind the group are two musical angels while on the left we see the Apostle Simon, also known as Simon Zelotes, holding a saw. Next to Simon is an angel with a basket of fruit. The composition rises up in a pyramidal shape with three playful, flying angels at the top next to the central tree. The painting can be related to another on the same subject, albeit on canvas and larger in size, now in the Musée de Picardie, Amiens. Joachim Wtewael was one of the leading representatives of the northern trend within Mannerist painting, among whose most important members were Cornelis Cornelisz. van Haarlem, Hendrick Goltzius and Karel van Mander. Like his contemporary Abraham Bloemaert, Wtewael worked in the city of Utrecht. Part of our knowledge of his activities derives from Karel van Mander, the painter and chronicler of artists’ lives who commented on one of Wtewael’s most notable features: his versatile ability to work with equal skill in both small and large formats. Wtewael initially trained with his father then with Frans Floris. He completed his studies with a trip to Italy and France in the company of one of his patrons, Charles de Bourgneuf de Cucé, Bishop of St-Malo, returning to Utrecht around 1592. Throughout his life Wtewael combined his activities as a painter with more profitable business dealings in linen. His artistic and political interests led him to become a founding member of the Guild of Saint Luke in his native city, which was set up in 1611, and a member of the city council on various occasions. This copper panel has been dated to around 1606–10 at a time when Wtewael worked regularly on this type of support, frequently depicting mythological subjects. The present scene depicts the Holy Family in an exterior with various saints and angels. The principal group is located on the right, arranged in lines, with the Virgin and a plump Christ Child on her lap next to the infant Saint John the Baptist with his lamb and reed cross. To the left of Saint John is Saint Elizabeth while Saint Joseph at the far right turns his head towards the viewer. The gathering takes place on the edge of a forest and is animated by two musical angels with a lute and harp behind the Virgin and Child. The scene is completed by a beautiful angel that offers the Christ Child a basket of fruit and by an old man with a saw on the far left, who has been identified as Simon the Apostle, also known as Simon the Zealot. Above the principal figures we see three small angels flying in unnatural poses as they gather red flowers from the upper branches of a tree. Together with the subject of the composition, the colours and colour combinations constitute one of the most important elements. The minute detail, vivid tones and perfect technique all make this panel, which would have been intended for private devotion, one of Wtewael’s most pleasing works. This delicate, carefully painted panel has been compared to another painting by the artist of around the same period depicting a Holy Family but on a larger scale and painted on canvas (Musée de Picardie, Amiens). It also includes the figure of Saint John the Baptist, but half-length with his left arm raised and not holding an apple. Other shared elements include the basket of grapes and apples that again occupies a prominent position, and the expressive gesture of the Virgin’s hand. The present panel entered the Thyssen-Bornemisza collection in 1989 from the New York art market.